Since your house is kept comfortable with an air conditioning unit, your attic will almost always be hotter in the summertime in comparison to your home’s inside. However, there's two concepts that may work as remedies for any attic that’s running a temperature: insulation and ventilation. Here’s a glance at these particular methods; why they are important and the way you can implement them in your South Bay area home. The reason why it’s important: As the summer sun beats upon the roof top, the shingles can warm up to 150 degrees or even more. This heat transfers in the roofing material and in to the attic air, where it's going to remain dormant and unbearably hot unless ventilation circulates the hottest air out and introduces comparatively cool air from the outside. This impacts household comfort because exceedingly hot attics enables heat to seep inside your house and drive your air conditioning unit to operate harder. Forms of attic ventilation: Probably the most subtle type of attic ventilation is natural ventilation, having a eave and ridge vents. Whenever a breeze shows up, air is forced inside at the eaves and rises out from the ridge vents. An even more aggressive and effective choice is attic fan ventilation, an approach designed to cool-down your attic by actively pulling air in from the outside. 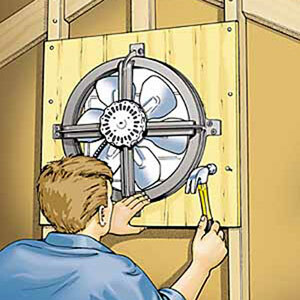 Selecting an attic fan: The fan you select ought to be able to move large quantities of air to make a difference in attic temperature. Look for a flow rate in cubic ft per minute (cfm) that equates to your attic volume level x 10, divided by 60. The reasons why it’s crucial: Attic ventilation and insulation perform hand-in-hand. In reality, insulation is necessary for ventilation in order to work, because with out a correctly enclosed and insulated attic floor, an attic fan will just pull conditioned air out of your home into your attic. Insulation must also never ever cover up vents intended for ventilation purposes. Kinds of attic insulation: There are several types, however the most cost-effective way for you to improve the insulation inside your attic is to distribute loose-fill insulation into any spaces you discover on the attic floor. For more information regarding attic ventilation and insulation for your South Bay area home, please contact Sandium Heating &Air today. That is nice drawing of ventilator.